Condor Pile Saws are absolutely unique. These saws are designed and built with speed and accuracy in mind. 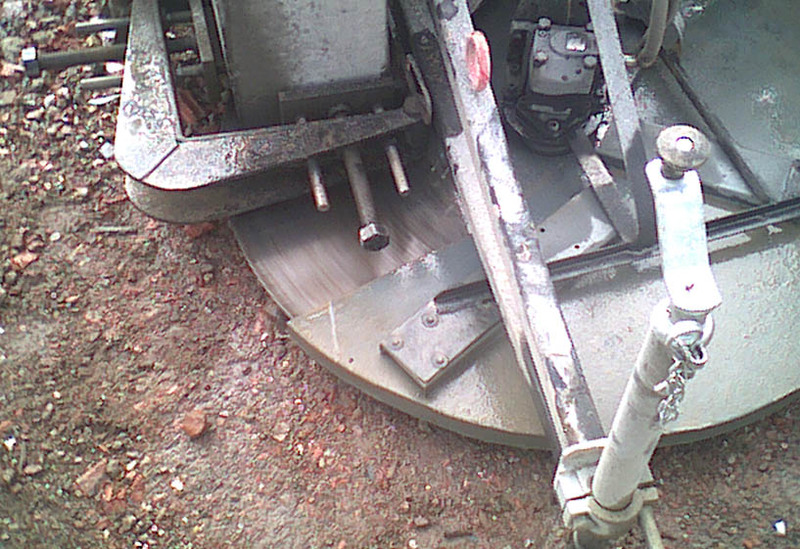 The saw will cut concrete piles in a fraction of the time it takes by other means and the finished product doesn’t need any dressing or capping. Tolerances are within +/-2mm making this the most accurate cutter available. With a quick coupling to the machine and its own levelling system, the Pile Saw is the perfect tool for the job. Condor’s T180 Bobcat has been modified to undertake a large number of tasks and has the capability to manoeuvre over the roughest of terrain. Our unique Pile Cutting machines and range of drilling rigs offer a service no one else in the UK can provide. The Condor Cofferdam is a unique piece of equipment, designed and built by Condor Projects Ltd for use on the waterways network, docks and harbours. Unlike any other dam, this can be used in a lock or similar to make a safe working area for up to three people at any time. The launch is simple and as it enters the water, the self righting floats make it possible for it to be manoeuvred with accuracy into the working area. Condor’s Ultra Low Ground pressure Trailers are designed for use on the canal towpaths, muddy and soft ground conditions. They are ideal where weight limits are enforced and unpaved areas where ground pressure is an issue. Our trailers are built with wide floatation tyres, making them ideal for this environment. These trailers can be towed by our 4×4 quad bikes for working in limited access areas. Working with a specialist manufacturer, Condor Projects Ltd has developed an accelerated grout for use in wet conditions where the initial set of the grout needs to be controlled or where a higher than normal early strength is required. 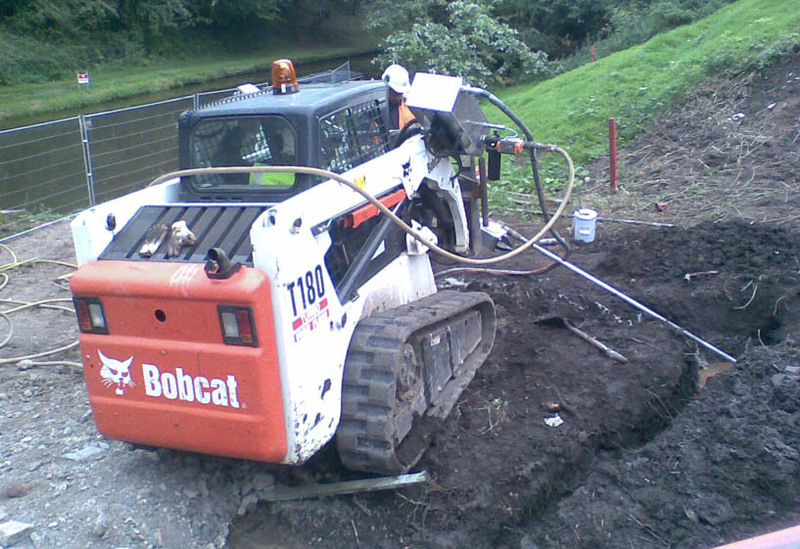 This has now been accepted as a standard by the design engineers at British Waterways for use on the canal system and in locks for stabilisation purposes. Our Excavator Drilling Rig has been designed and built by Condor Projects Ltd for use on embankments where access is restricted. In the right ground conditions a soil nail or anchor can be driven to over 20 meters. By hiring locally, the cost of mobilisation is kept to a minimum, allowing Condor Projects Ltd to be very competitive on smaller projects. Condor Projects Ltd’s Ground Anchor Flush Plates are to allow plates to be fitted to any surface and tensioned without leaving any protrusions above the surface. By engineering the locking nut below the plate, the plate is tightened onto the nut using a bespoke tightening key. A bespoke saddle allows the anchor to be tensioned to a predetermined setting and the plate to be screwed down to the surface. The tension is then relaxed to allow the anchor to pull the plate onto the surface and locked in position. Using the locking key holes, once the plate is tightened to the required tension, a non shrink grout is introduced into the underside of the plate, forming a locking system and allowing the load to be spread equally across the area of the pattress plate.